How should you prepare for your upcoming trip to beautiful Thailand? What should you pack? Do you need to apply for a visa? This post is here to help you get ready for you backpacking adventure. Long-Tail boats on a remote island close to Krabi. This really feels like paradise! For me, the preparations were a little hectic. I applied for a semester abroad at Chulalongkorn University in Bangkok as part of my Bachelor studies. The fall semester started in early August and ended in the beginning of December. I received my letter of acceptance some time around March I think. Then in April and May, Thailand, and especially Bangkok, experienced some pretty bad riots so I was not even sure whether I could go after all. That’s why I only booked my flight in late June. I flew Airberlin which was okay, the return flight was around 720€. But you can find much cheaper flights to BKK now. Find the best flight deals on Skyscanner (US website) or Skyscanner (UK website) . Let’s assume you’re flying into Bangkok for this trip. I often book directly at the airline’s website, flights can be less expensive there. But Skyscanner does give you a pretty good overview on which airlines fly to your desired destination. So just look around a little and you’ll find a good deal. As I was staying in Thailand for more than 60 days, I needed to apply for the 90 days Non-Immigrant multiple entry visa (More on visas here: http://www.mfa.go.th/main/en/services/123). Several issues with that: Finding a consulate issuing a visa not only in express service but also with multiple entries. I drove to the Thai consulate in Frankfurt which, after I had waited about 4 hours in line, told me they could not issue it on time. Panic! So, I searched the Internet again and after a few phone calls, a nice lady of the consulate in Stuttgart told me, she could arrange everything. And I didn’t even have to go there, everything was done by post and I actually got my passport back one day before my flight. Puh! Concerning the 90 day visa – you can either get it renewed at the immigration office in Thailand, or what I did is, I flew to Vietnam and then got a 60 day extension. Before I started packing my suitcase, I got my third rabies vaccination (got the first two before going to Oman). My doctor strongly recommended that and I was happy I got it. I could play with stray dogs and feed monkeys without any fear while my friends always carefully stayed away. If you got all regular vaccinations as a kid, you should be fine otherwise. But make sure to check with your doctor beforehand. He can also recommend which medication to take with you. My mom had him prescribe me Malaria pills, which I was supposed to take when traveling to dangerous areas. In general though, Malaria is rather rare in Thailand and I never took the pills (they’re so expensive, I wouldn’t recommend buying them). Anyway, you should always wear mosquito repellent. During my time in Thailand, a lot of friends got the Dengue fever which puts you down for several weeks sometimes. That’s not what you want during your vacation. As there is no direct treatment against Dengue, protection is the only way to go. To be honest though, my mosquito repellent bottle wasn’t even half empty when I left for Germany – I hate the smell… So yes, I was kind of plagued with a lot of mosquito bites (personal record: around 40 bites per leg at a time) and I wouldn’t have made it without my beloved Tiger Balm. And luckily, I didn’t catch the Dengue. Packing… Urgh… One suitcase, 4 months.. Help! I always have trouble deciding which of my favorite tops and pants and heels and sandals and accessories to bring and even so I knew I’d go shopping a lot in BKK, my suitcase was already way too full… What I would recommend is that you take only half of what you think you need, you will seriously buy a lot of stuff in Thailand. It’s so cheap and yeah, in the end, you’re kinda of gonna blend in with the backpacker crowd. Anyway, if you’re spending your time on the islands, you’ll not be wearing much all day. Nevertheless, don’t forget a pair of long pants if you want to visit temples or go to the jungle (helps against mosquitoes). A cardigan or light sweater is also nice as buses, taxis, and most buildings like making you feel like it’s the deepest winter (I hate A/C – 35°C is so much better, honestly). If you plan on going to the nicer clubs in BKK, you should bring one good outfit. But in most backpacker hot spots, come as you want. Besides that, you might want to bring sun screen (usually more expensive in Thailand) and other toiletries and cosmetics unless you don’t like a nice tan and want to use whitening deodorant, body lotion, make-up, and what not. But it’s Thailand and as pale Westerners, we love getting our tan on. Well, I believe, these are the most important tips for your preparation. If you have any other questions, please feel free to get in touch with me. P.S. One last advice: Don’t plan too much – be spontaneous and adventurous instead and take things as they come. Your experience in Thailand – and anywhere in the world – will be so much better. 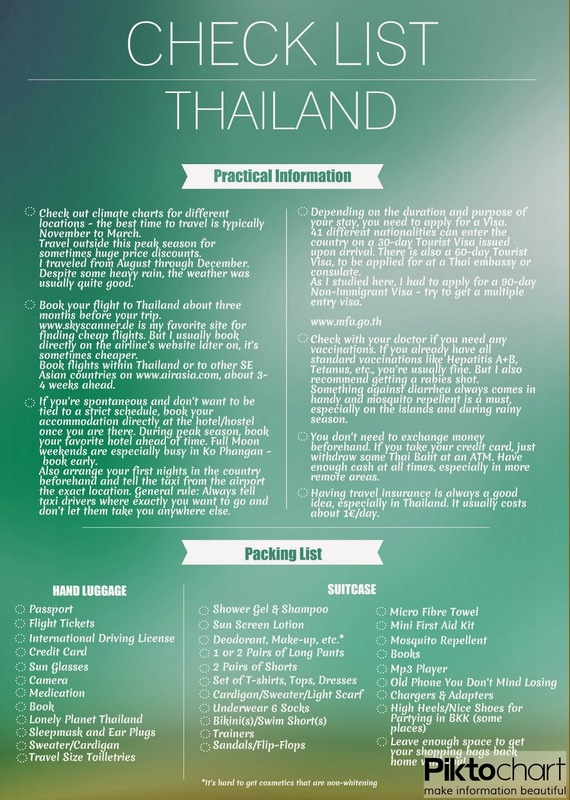 Nevertheless, here’s a sample itinerary for your Thailand trip. Also have a look at these must-see places across Thailand. My new adventure: Volunteering with Lema in Guatemala!